Peter Robinson is Senior lecturer in History and Sociology at Swinburne University of Technology, Melbourne. 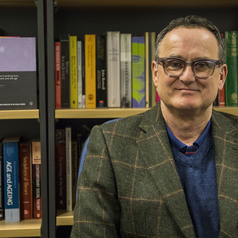 His first book, The Changing World of Gay Men (Palgrave Macmillan, 2008) won the inaugural Raewyn Connell prize for the best first book in Australian Sociology. His research interests include ageing, sexuality, and social justice. His second book, Gay Men’s Relationship Stories Across the Life Course was published in June 2013 (Palgrave Macmillan) with a Foreword by the Hon. Michael Kirby AC CMG. And his third book, Gay Men's Working Lives, Retirement and Old Age, also with Palgrave Macmillan was released in August 2017.